What makes this boot lightweight is that it doesn’t have steel or composite—it’s soft toe. The boot also features a light, shock-absorbing molded midsole. In addition to the boot being lightweight it’s also very comfortable to wear; thus you can be on your feet the entire day. The comfort is brought about by the removable high-performance shock-absorbent cushion insert. The boots also have a padded collar and tongue that adds to the comfort. When it comes to support and stability, the boots have a good quality composite shank. Unlike other work boots that are complex to wear and remove, these aren’t. To make your work easy, they have a heavy-duty YKK zipper that makes it for you to wear them in the morning and remove at the end of the project. At the time of writing this review, the work boots had over 1000 reviews and a four-star rating. Most of the reviews were positive such as: “great work boots,” “comfortable and value priced,” “provide great traction in all seasons,” and many others. While most of the people were satisfied with the boots, there are a few that had complaints. The few that had issues with them said that they were too large for their feet. Others said that they too a little bit longer to break in. To buy the right boot its recommended that you take accurate measurements of your feet before making the purchase. To provide you with the much needed lightweight feature these boots are made from a blend of leather and mesh. They weigh 20.8 oz/ 589.7 g. To make them even lighter, the sole is made from rubber. You should note that while the sole is made from rubber, it’s oil and slip resistant thus you can work with the boots even in the wettest areas. In addition to these boots being lightweight, they are also very comfortable thus you can be in them the entire day. The comfort feature is brought about by the mesh liner that provides breathability. The units also have a removable metatomical dual density EVA footbed that is designed to provide you with the best arch support. To provide you with the highest level of protection, the boots have an asymmetrical toe protection feature. The toe bot is also larger giving your toes space to breath. Due to the large space, you can move and flex the toes avoiding pinching your foot when the foot is hyper-flexed. At the time of writing this review, the work boots had over 1,200 reviews and a 4.4-star rating. 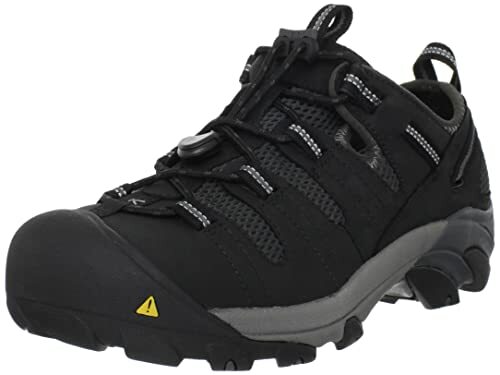 As you would expect, most of the reviews were positive such as: “mmm, I like it,” “very comfortable, durable, and worth the money,” “great steel toe shoes,” and many others. The few customers that didn’t like the boots complained about the sizing. Some said that they were wider while others said that they were narrow than expected. To avoid this issue, measure the width of your foot. If your feet are wide, go for wide boots and vice versa. When you look at this boot for the first time, you might think that its heavy, but this isn’t the case. The boot has many features that make it very lightweight. One of these features is the outsole. It is made from single density polyurethane. The boot is also soft toe—not steel toed. While it’s lightweight, the safety shoe provides you with maximum protection from the tough elements found at the work site. It’s made from leather which gives you peace of mind as you know that your feet will have maximum protection. To provide you with comfort when working, the safety shoes have a removable dual-density shock absorbing footbed. The few customers that had issues with the boots complained that they were either too big or too small. Before you order them, ensure that you take accurate measurements of your feet. Two things make these boots lightweight are: the rubber sole and the fact that they are a soft toe. 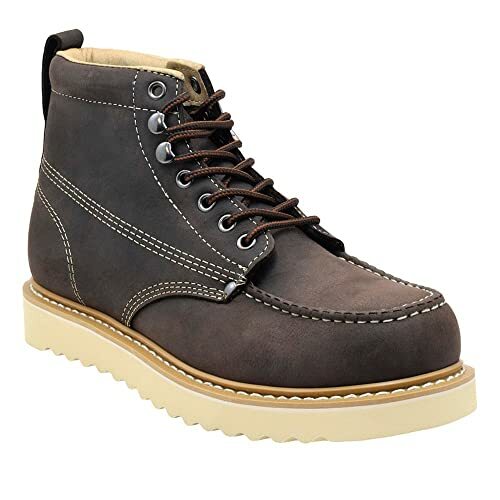 The attractive thing is that these lightweight boots are made from leather using Goodyear welt construction which gives you peace of mind that they will last for a long time. Although, the sole is made from rubber, its slip-resistant thus you can comfortably work in wet environments. To ensure your comfort when working, the boots have a comfortable cushion insole that keeps your feet comfortable the entire day. One of the major problems with construction workers is the challenges of putting on the boots and removing them at the end of the day. These shoes have convenient, speedy hooks and back loop that makes it easy to wear the boots. When buying the shoes, you should note that they are designed to be bigger than the regular shoes. This makes them an ideal choice if you have big feet. 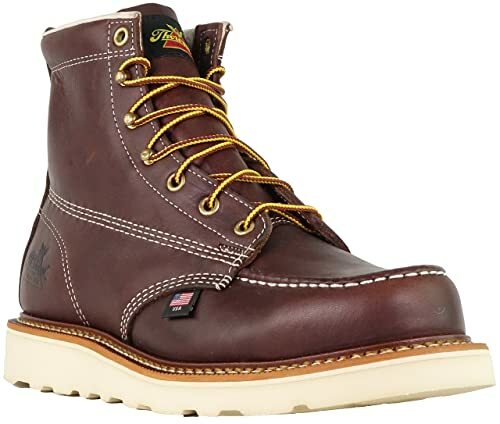 At the time of writing this review, the work boots had over 700 reviews and a 4.5-star rating. Most of the reviews were positive such as: “great work boot,” “fantastic,” “I’m very happy with the product,” and many others. The few that were unsatisfied with the boot complained that it was bigger than they expected with is described in the product. They were originally designed for farmers and hunters, but they are now majorly worn by construction workers. The main thing that makes them very lightweight is the wedge sole. While they are lightweight, they are made from premium full grain leather that ensures that they are durable. To ensure your comfort, the boots feature a mesh lining and pigskin collar that keeps your feet warm even when it’s cold. When making the purchase, you should note that they run a little bit bigger than your regular shoe; therefore, it is wise that you order a size smaller than your regular shoes. At the time of writing this review, the work boots had over 400 reviews and a 4.2-star rating. Most of the reviews were positive such as: “best boot bang for the buck! !” “very good and comfortable work boot,” “worth every penny,” “cheap, comfortable, and lightweight,” and many others. The few customers that weren’t satisfied complained that the boots were too big for them. You should note that the manufacturers have already mentioned this. Other customers complained that the boots took a long time to break in. Less weight on your feet: This is a no-brainer. Lightweight boots aren’t bulky; therefore, they don’t put a lot of weight on your feet. Since its common to wear the shoes the entire day, the lightweight nature comes in handy as it ensures that you don’t have to struggle with pain the whole day. This ensures that you enjoy your work. More comfort: Since the boots aren’t bulky, you are comfortable wearing them to work. In most cases, the shoes are made using a soft cushion that cushions your feet. They are also made from flexible materials that support your feet and facilitate better feet movements. These features ensure that you are comfortable the entire day. Better grip: While they are lightweight, they are often made from high-quality materials that provide better grip on your feet. 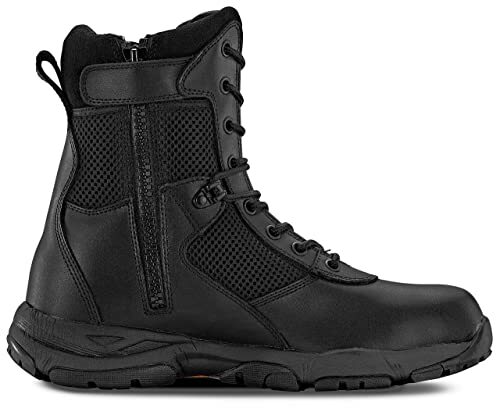 Breathability: The boots also have abrasion and waterproof features that keep your feet dry even when you sweat. They are also made using insulation technology that repels moisture, encourages heat retention, and ensures that the boots breathe better. Productivity: Since you will be comfortable when working, you will be more productive as you will not only be able to walk long distances, you also will be pleased walking the entire day. The extra effort you put into the work increases your productivity thus you accomplish more. Weight: This is an obvious one as you are looking for a lightweight work boot. To tell whether the boot is lightweight you only need to wear it and walk in it around the storeroom. If buying online, check the features of the boot. If too heavy, stay away from it. Toe type: Although, you are looking for a boot that is light enough for you to walk in the entire day, it also should protect your toes. Work boots have three types of protective toes: steel, composite and aluminum. Steel toes are the most common and often the heaviest and most compact. Although, your feet won’t be in direct contact with the boots thus you won’t be uncomfortable when you wear them, they tend to conduct temperature more than the other options. For years, people have been complaining that steel toe work boots are uncomfortable. Footwear manufacturers have now come up with ways of improving the fit and comfort of the boots by installing toe-caps that fit the work boots perfectly. Aluminum toes are a little bit lighter than the steel toes and still provide you with the protection you need according to the ANSI/ASTM safety standards. 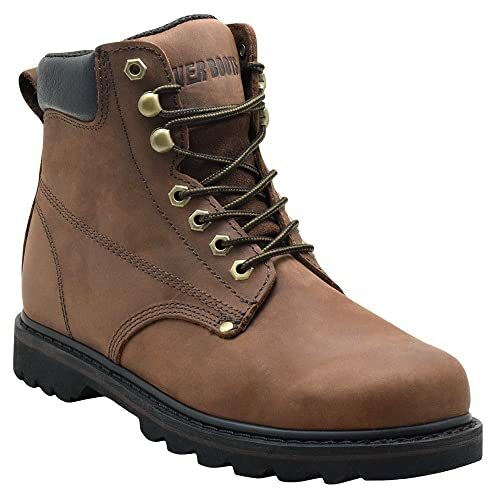 As a worker looking for lightweight work boots, these are the best shoes to go for as they will provide you with enough protection while at the same time protecting your feet. Composite toes are made up of Kevlar, plastic, and carbon fibre. They comply with ANSI/ASTM requirements and are often lighter than steel. Although, they are thicker in their construction, they don’t transfer heat or cold as they are non-metallic. These work boots are a great choice for you if you are working in an environment that requires you to be metal-free. Metatarsal guards: Another thing you need to consider when buying the work boots is the presence of the metatarsal in the boots. The guards are units that protect the upper part of the foots and also the toe area. Due to the protection, your feet are protected from heavy falling objects. Some work boot manufacturers have come up with features that increase the safety of the boots. For example, some of the manufacturers use tough-tech leather that increases abrasion resistance in the boots. The leather is often added to the uppers of the boots. Rubber outsole: Rubber is used by many manufacturers as it’s easy to get. It’s also abrasion, oil, and slip resistant. One of the most common types of rubber used in making the soles is Vibram. Since the material is light, it makes an ideal choice for lightweight work boots. TPU outsole: TPU stands for Thermo polyurethane and the soles made from it are durable, oil, abrasion, and chemical resistant. The soles also resist splitting and are often lightweight than their rubber counterparts, which makes them even better alternatives when looking for lightweight work boots. Cement: In this construction, the sole of the boot is cemented directly to the upper of the boot. Boots made using this method are usually lightweight and flexible. Their only flaw is that they tend to de-laminate over time. You should note that once the sole comes off, you can’t re-sole them. Goodyear welt construction: This is probably the most common style of construction. In this type, the upper and inner sides of the sole are stitched together with a leather strip or welt. The sole is then stitched through the welt. Due to the construction, you can re-sole or repair the work boot. This comes in handy in extending its life. Work boot manufacturing companies are every day coming up with new and exciting ways of making the boots more durable. For example, KEEN makes its boots by combining the Goodyear construction method with the cemented toe-cap. This construction method protects the stitching of the work boot and reduces de-lamination from repeated flexes. Fitting: The final factor you should consider when buying work boots is how properly they fit you. Even if they are lightweight, there is no way they are going to make your life easier at the job site if they don’t fit you properly. Before you make the purchase, you should wear the work boot and test it. Only consider buying the boot if it fits you perfectly. Guessing the size of the work boot: This often comes about when buying the shoes online. Many people buy boots that are the same size as their regular shoes. While sometimes they sometimes buy boots that fit them perfectly, in some cases they don’t which results in plenty of complaints. To avoid buying a boot that doesn’t fit you properly, you should take the right measurements for your shoe. You also should read the online reviews left by previous customers. If you notice that the boot runs a size larger, order a shoe that is a size smaller than your regular boot. If on the other hand, you notice that the boot is smaller, order one that is a size larger than your regular shoe. If you will be buying the boot from a local store, always try on the boot—don’t assume that it will fit you when you get home. If you have done all of the above and you get home, and you notice that it doesn’t fit you properly, go ahead and return it. Buying a cheap boot: If you are like most people, you shop with your eye on the price of the work boot. While there is nothing wrong with this, you should avoid buying a boot that is too cheap as you will most likely end up with a poor quality boot. You should note that like everything else, you get what you pay for. When buying a work boot, you should treat the purchase as a long-term investment. This calls for you to go for an excellent quality work boot. While it will be expensive to buy, it will last for a long time, making the extra cost worth it. Buying the wrong boot for your feet: You will agree with me that we all have different types of feet. There are those with large feet, others with small feet, others with wide feet, and so on. You shouldn’t buy a work boot simply because someone else bought a similar one—you need to pay close attention to the type of your legs. If you have wide feet, there are many good quality work boots for wide feet that you can go for. You only need to locate the right ones and make your purchase. Forgetting about after work use: Most workers wear their boots out of the workplace. While they know that they will wear the boot out of the construction site, most of them fail to pay attention to the style of the boot when making the purchase. This often results in them buying a boot that is unpleasing to look at. To avoid this, you should buy a lightweight work boot that is not only functional, but also attractive to look at. The cool thing is that there are many brands such as KEEN and many others that stock good quality boots that are very beautiful to look at. Focusing too much on the brand: While most reputable brands have good quality shoes, it’s not always the case. Some less-known brands have good quality boots. When making the purchase, you shouldn’t pay a lot of attention on the work boot—you should mostly be concerned with the construction of the boot. If the work shoe is well constructed and light enough for your feet, there is no reason you shouldn’t buy it even if its manufactured by a company that isn’t too popular. Buying the right boots for the wrong job: This is a mistake that is often made by first-time work boot buyers. Most of them buy the first boots that they come across without thinking about the environment that they are working on. The result of this is you being uncomfortable when working. The work boots also tend to get damaged fast. To be on the safe side, you should always put in mind the area you will be working on as different areas require different types of work boots. For example, if you will be working on cement, go for boots that provide you with high-quality shock absorption. If you will be working mostly indoors, you don’t have to invest in boots that provide you with a lot of insulation. If you aren’t sure of the right work boots for the environment you will be working on, get the input of a professional.